MISSION, KS--(Marketwire - October 25, 2010) - (Family Features) Scare up a happy Halloween party to celebrate the spookiest season. Bring out the orange and black linens, spiderweb doilies and skull coasters ... so easy and effective! The entertaining experts from the Wilton Test Kitchen say it's easier to mix and mingle if you don't have to juggle a fork. So cast a spell with a savory buffet starring these deliriously delicious recipes. For additional Halloween ideas and directions for making cocktails, eyeball, skull and skeleton candies, and skull pound cake, go to www.wilton.com. Defrost bread dough according to package directions. Brush the cavities of Wilton Dimensions Multi-Cavity Mini Pumpkins pan with melted butter. Cut each loaf into 8 equal pieces; shape into rolls. Place rolls, seam side up, in each cavity. Cover loosely with plastic wrap; leave in warm place until doubled in size (about 45 minutes). Preheat oven to 350°F. Remove plastic wrap from dough. Bake 24 to 26 minutes, or until tops are golden brown. Cool in pan 10 minutes; remove from pan and cool completely. In shallow glass dish, combine olive oil, red wine vinegar, garlic, Worcestershire sauce, salt, thyme, mustard and pepper; whisk to combine. Add steak and turn to coat evenly. Cover and refrigerate 4 hours or overnight, turning steak occasionally. Preheat broiler to high. Prepare broiler pan with vegetable pan spray. Remove steak from marinade; broil 6 minutes on each side for medium rare. Cover steak with foil and rest 5 minutes. To make bite-size pieces, cut steak into four strips with the grain; cut strips against the grain into smaller pieces. Cut pumpkin rolls in half, fill with steak and favorite condiments, and serve. In large bowl, beat butter with electric mixer until creamy. Add cheese, flour, rosemary, salt and pepper; mix until combined well but still crumbly. Add water; mix until dough pulls away from sides of bowl. Flatten dough into a disk; wrap tightly in plastic wrap and refrigerate at least 30 minutes. Preheat oven to 350°F. Spray cookie pan with vegetable pan spray. On lightly floured surface, roll dough to 1/8 inch thick. Cut dough with Halloween Linzer Cut Outs Cookie Cutters, cutting both solid round and round with cut-out crackers. Place on prepared pan. Reroll dough scraps and repeat cutting. Bake 15 to 17 minutes or until crackers are slightly golden at the edges. Cool 3 to 4 minutes on pan; transfer to cooling rack and cool completely. In medium skillet, heat olive oil over medium heat; cook onion, stirring occasionally, until caramelized about 10 minutes. Remove from heat; cool completely. In medium bowl, combine cheese spread and caramelized onions; mix well. Spread on solid crackers; top with crackers with cut-outs. Serve any remaining cheese with fresh vegetables or purchased crackers. Omit the caramelized onions and spread sandwich crackers with cheddar cheese or herbed cream cheese spread. Spray 9 x 13-inch baking pan with vegetable pan spray. In large saucepan, combine chicken stock, milk, salt, pepper, garlic powder and nutmeg; bring to a boil. Stir in pureed sweet potatoes; bring back to boil. While constantly whisking, add cornmeal in a slow, steady stream, making sure there are no lumps. If desired, add Orange Icing Color. Reduce heat and continue stirring until thick, about 3 minutes. Stir in cream cheese; stir until melted and smooth. Pour into prepared baking pan. Let set at room temperature at least one hour or refrigerate for longer. Cut into shapes with Mini Halloween Cutter Set. Serve. Leftover polenta scraps can be made into croutons. Toss with olive oil and pan fry until golden brown. Drain on paper towels. 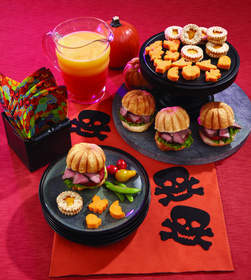 Slice premade polenta into 1/2-inch rounds and cut with Mini Halloween Cutter Set. Preheat oven to 350°F. Spray cavities of Wilton Petite Loaf Pan with vegetable pan spray. In small bowl, dissolve instant coffee into boiling water; set aside to cool. In medium bowl, combine flour, baking powder, baking soda and salt; set aside. In large bowl, beat butter and sugar with electric mixer until light and fluffy. Add eggs, one at a time, mixing well after each. Add vanilla, chocolate, and coffee; mix well. Add flour mixture alternately with buttermilk, starting and ending with flour; mix well. Stir in chocolate chips. Pour into prepared pans. Bake 16 to 18 minutes or until cake tester inserted into center comes out clean. Cool in pan 5 minutes; remove to cooling grid and cool completely before icing. In microwave-safe bowl, heat chocolate chips and cream for one minute on 50% power; stir to combine. Continue heating at 30 second intervals until chips are melted and combined with cream. Let stand until thickened slightly. Spread the tops of each cake with a layer of chocolate cream; sprinkle with cookie crumbs, pressing lightly into chocolate. Insert skeleton candies. Preheat oven to 350°F. Lightly spray Wilton Finger Cookie Pan cavities with vegetable pan spray. In large bowl, beat butter and sugar with electric mixer at medium speed until well blended. Beat in egg and extracts; mix well. Combine flour and salt; add to butter mixture. Beat until well blended. Remove half of the dough from the mixing bowl and set aside. Add 2 tablespoons cocoa powder to remaining dough; mix until completely incorporated. Press dough into prepared pan cavities, filling 2/3 full. Decorate cookies with icing gels, melted candy, sprinkles and sugars, as desired.